This most recent presidential election season saw the normalizing of white nationalism and fanning of racial tension for the cause of political expediency. The Black Lives Matter movement reminds us that racism, particularly within the judicial system, where people of color make up a disproportionate percentage of those incarcerated, remains a persistent stain upon the soul of our nation. 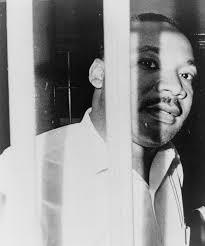 Dr. King’s letter from his jail cell in Birmingham still speaks. Speaks to those of us who are complicit in our silence. Speaks to encourage those standing up for those on the margins (people of color, the poor, refugees, undocumented immigrants, LGBTQ, women denied equal rights). Letter from Birmingham Jail or Letter from Birmingham City Jail, is an open letter written on April 16, 1963, by Rev. Dr. Martin Luther King, Jr., an American civil rights leader. . He gave bits and pieces of the letter to his lawyers to take back to movement headquarters, where the Reverend Wyatt Walker began compiling and editing the literary jigsaw puzzle. King’s letter is a response to a statement made by eight white Alabama clergymen on April 12, 1963, titled “A Call For Unity“. The clergymen agreed that social injustices existed but argued that the battle against racial segregation should be fought solely in the courts, not in the streets. They criticized Martin Luther King, calling him an “outside agitator” who causes trouble in the streets of Birmingham. Below are highlights from the more lengthy letter penned by Dr. King. 16 April 1963 My Dear Fellow Clergymen: While confined here in the Birmingham city jail, I came across your recent statement calling my present activities “unwise and untimely.” Seldom do I pause to answer criticism of my work and ideas. If I sought to answer all the criticisms that cross my desk, my secretaries would have little time for anything other than such correspondence in the course of the day, and I would have no time for constructive work. But since I feel that you are men of genuine good will and that your criticisms are sincerely set forth, I want to try to answer your statement in what I hope will be patient and reasonable terms. Moreover, I am cognizant of the interrelatedness of all communities and states. I cannot sit idly by in Atlanta and not be concerned about what happens in Birmingham. Injustice anywhere is a threat to justice everywhere. In any nonviolent campaign there are four basic steps: collection of the facts to determine whether injustices exist; negotiation; self purification; and direct action. We have gone through all these steps in Birmingham. There can be no gainsaying the fact that racial injustice engulfs this community. Birmingham is probably the most thoroughly segregated city in the United States. We have waited for more than 340 years for our constitutional and God given rights. The nations of Asia and Africa are moving with jet like speed toward gaining political independence, but we still creep at horse and buggy pace toward gaining a cup of coffee at a lunch counter. Perhaps it is easy for those who have never felt the stinging darts of segregation to say, “Wait.” …. Now, what is the difference between the two? How does one determine whether a law is just or unjust? A just law is a man made code that squares with the moral law or the law of God. An unjust law is a code that is out of harmony with the moral law. To put it in the terms of St. Thomas Aquinas: An unjust law is a human law that is not rooted in eternal law and natural law. Any law that uplifts human personality is just. Any law that degrades human personality is unjust. All segregation statutes are unjust because segregation distorts the soul and damages the personality. So I have not said to my people: “Get rid of your discontent.” Rather, I have tried to say that this normal and healthy discontent can be channeled into the creative outlet of nonviolent direct action. And now this approach is being termed extremist. But though I was initially disappointed at being categorized as an extremist, as I continued to think about the matter I gradually gained a measure of satisfaction from the label. Was not Jesus an extremist for love: “Love your enemies, bless them that curse you, do good to them that hate you, and pray for them which despitefully use you, and persecute you.” Was not Amos an extremist for justice: “Let justice roll down like waters and righteousness like an ever flowing stream.” Was not Paul an extremist for the Christian gospel: “I bear in my body the marks of the Lord Jesus.” Was not Martin Luther an extremist: “Here I stand; I cannot do otherwise, so help me God.” So the question is not whether we will be extremists, but what kind of extremists we will be. Will we be extremists for hate or for love? Karen, thank you for all the good you, Jim and your team do to keep the Dream alive. Travel well!